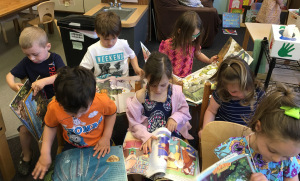 This is a wonderful post (via https://jenniefitzkee.com) and I was so surprised at these 4 year old students gathering together to read, even though they can’t truly read yet. However, the environment in their teacher’s school room has fostered a love of books and the need to want to learn to read. Remarkable! Independent reading. SSR. Call it what you like. It is crossing over from learning to read words, to learning to read. Parents and teachers alike take a deep breath and clasp their hands together when this happens. There are no words to say. Words might spoil the moment. After all, major milestones don’t happen often. I was busy in the classroom, working with children on a 100-piece puzzle. Things were bustling yet quiet. I looked over at the big rug and saw children dragging chairs. Little did I know that they wanted to arrange chairs in order to read books. After they set up chairs on the rug, they went for the books. Then they sat down, together, to read independently.